I've never read any Sophie Kinsella before. It's true. I'm not sure if it was the titles of her Shopaholic series that put me off, or if they were merely big at a time when I wasn't reading much chick lit at all, but one way or another I was never tempted to pick them up. After that. I likely relegated her name to that series alone and never investigated any further. Silly me. But. I began seeing reviews of her latest, I've Got Your Number, popping up here and there. Ari's review over at Emily and Her Little Pink Notes in particular caught my eye (as her reviews are wont to do). So (and this is becoming a familiar refrain), when it popped up on NetGalley I just went right ahead and hit request. As far as covers go, I'm liking this one. I love the silhouettes, the text bubbles, and the font. More importantly, I think the cover overall accurately gives the reader a sense of what she will find inside--a phenomenon that seems to me to be becoming rarer these days. Poppy has, well, she's taken leave of her senses. In a moment of madness, she allowed her bridesmaids to pass around her engagement ring at a posh party in a London hotel. It (along with her cell phone) go missing in the fray, and Poppy is reduced to canvassing the entire hotel and menacing the staff into finding the missing ring. Alas, nothing turns up. But the frantic Poppy does spot a discarded cell phone in the hotel garbage. Utterly at her wit's end, she snatches up the phone in order to stay in contact with the hotel in the coming days, hoping they'll call saying her fiance's treasured family heirloom has magically appeared. But a wrench is thrown in the wheel of Poppy's mad machinations, when one Sam Roxton enters the scene saying the phone she found belongs to his former PA and he needs the information on it ASAP. Poppy convinces Sam to let her keep the phone just until the ring is found, promising to forward on any and all important messages and emails. And so a hilarious and awkward relationship is born. Poppy and Sam become inextricably linked through a near constant stream of texts and emails. Being the outgoing, curious girl she is, Poppy can't resist peeking into the insane business world Sam lives in. And for his part, Sam loosens his tie long enough to offer his help and opinions (welcome or not) on Poppy's tendency to be a pleaser and focus on everyone else but herself. I've Got Your Number is a real charmer. Though it might initially feel like you've read this story before, the connection between Poppy and Sam quickly breathes life into a potentially tired setup. On top of her two sympathetic leads, Sophie Kinsella drizzles hysterical predicaments throughout the story, ensuring that I stayed up well past my bedtime laughing. Incorporating texts, emails, messages, and footnotes into a narrative can be courting disaster, I often think. Many a story stumbles in its execution when these elements aren't handled just right. Happily, "just right" is exactly the note Kinsella strikes. The various communications feel real and appear in natural and perfect amounts, enriching but never overwhelming the story. The heart of this book is in the unexpected discovery of kindred spirits by two people who were so busy filling their lives with things they thought they wanted, so busy being the people they thought they should be, they didn't even realize what was missing. It's a slow burn sort of falling in love. You're all in before you realize it. And, as long as we're talking romance, I'll just go ahead and say that I've Got Your Number builds up to one of the most steal-your-breath moments I've had the pleasure of reading. Seriously. The fact that their relationship is conducted and developed primarily via technology (though they do interact some in person) leads to some pretty fabulous and subtle buildup, and it all happens without the reader even noticing. So, so worth the wait. All in all, I've Got Your Number has everything I want in contemporary chick lit. I'm so glad I gave Kinsella a shot, and I will definitely be coming back for more. I've already gifted a copy to my sister. I rather suspect it'll be just the thing. I'm so glad to see that you enjoyed this book. I adored it too. I thought Poppy and Sam were too cute for words and I enjoyed their back and forth. Kinsella writes wonderfully cute and funny stories and you should definitely give Can You Keep a Secret a go...I read a couple of the Shopaholic series and gave up on it. Becky Bloomwood drove me nuts. Anyway, great review! I was nodding right along with everything you said. Rowena, I'm really happy to hear you recommend Can You Keep a Secret. Will go check it out immediately. yaaay! 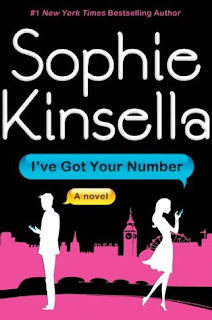 I haven't read this one yet, but I love Sophie Kinsella and think she deserves all the love. Please read Can You Keep a Secret? as well! Amy, another vote for Can You Keep a Secret. Yay! Tina, I'm taking notes. Twenties Girl. Mm-hm. You're not the only one who was wary of the Shopaholic series. I've only read The Undomestic Goddess by her and that was a lot of fun. Mems, ah, that's good to hear. I'm glad Undomesticated Goddess was good. And you read JANE!! This fills me with delight. And now I'm trying to guess which scene you mean . . . hmmm. I'm torn between two. This made me heart happy! YAY SOPHIE KINSELLA! I totally get what you mean about the shopaholic books, quite sad that they're what she's most famous for when it's her stand alone chick lit that is her finest work. As soon as I saw you'd never read any of her work before I was like omg! Angie simply *must* read Can You Keep A Secret? and then I saw the comments! yessssss you must, it is completely hysterical! also, I vote you also read Undomestic Goddess, complete and utter hilarity and insanely swoonworthy. Carla, you love her, too?! Well, then. I can hardly wait to get my hands on Can You Keep a Secret? now. It will be mine! And Undomestic Goddess shortly thereafter. Can You Keep a Secret is one of my VERY favorites of hers. Maybe I need to read it again. And Twenties Girl had me rolling with laughter. Janssen, I put it on hold at the library and got the email that it's in today! Will be picking it up tomorrow for sure. I really enjoyed this book too! For some reason, I hate the Shopaholic series (okay it's probably because I found Becky incredibly grating starting about halfway through the second book) but I love Kinsella's standalones, like this and the already recommended Can You Keep a Secret? (so fabulous!) and The Undomestic Goddess along with Remember Me? Bookworm, I'm getting the vibe that the Shopaholic ones go downhill. I've been there done that with other series, so I think I'll stick to the standalones with Kinsella. I just finished it ... a fun book! Teena, exactly. It's just a fun one all around. I enjoyed this one, too, and agree with you about the ending. I was also surprised by how well the texts and emails worked--often they can be tiresome to read in a novel. They really can. I was surprised at how effortless they folded into the narrative here. Love the ending . . . I love Kinsella's books, even though they all seem implausible and somewhat similar. Nothing better to get my spirits up than curl up with one of her books. So far my favorite by her is Twenties Girl!